Since En Vogue was originally formed to recapture the spirit and sound of successful girl groups from the ‘60s such as The Supremes, it’s only fitting — amid the 2002 performance at Alabama State Fairgrounds in Birmingham that's captured on Live in the USA — that the women decide to “pay tribute to the divas that paved the way” for them. As illustrated on this DVD, which was released on January 20, the group's deference extends to perfectionism, even after a lengthy history that has endured a revolving door of member shakeups, label changes, and popularity fluctuations. Such is evident even before the performance itself, as in rehearsal footage that finds veteran members Cindy Herron-Braggs and Terry Ellis along with then new (and now former) member Amanda Cole braving a chilly December morning (while battling jet lag following a long trip from Los Angeles) as they prepare to dazzle audiences. They discover that the biggest rehearsal space would be in the locker room shower of the stadium, the ladies of En Vogue remaining in their sweaters and hats, trying to master the group's complicated, signature movements and the concert's choreography (which they were taught during rehearsal just two days prior). As well, they practice their frequent lead vocal changes, designating who takes the front of the stage for a chorus or a solo spot. The women of En Vogue appear refreshingly down-to-earth, despite an unparalleled legion of fans, including those who — like this reviewer — grew up with their many girl power anthems of the ‘90s. Their success not only deemed them as the most successful female group of that decade, but as Billboard Magazine reports, “the eighteenth most successful act of the 1990s” overall. The film shows them easily adapting to machine mishaps during a sound check and ably handling everything in stride. Such is apparent right from their confident walk onstage, which finds the former “Funky Divas” trading in their slinky trademark black dresses for a more casual look of jeans and silk shirts. Of course, for fans of the group, it’s the all-too-brief 61-minute concert that will first grab your attention, as it intercuts the live performance, filmed in color, with black and white sound check photography and a little behind-the-scenes, candid preparation footage throughout. However, MVDvisual and Charly Films ensure that viewers have an experience that goes beyond simply a concert. Boasting 105 minutes of bonus material alone — such as the disc’s extensive, post-show focal point that includes interviews with Herron-Braggs (in which she discusses the group's history and the much publicized, rumor-filled departure of Dawn Robinson), Ellis, Cole, as well as the group's manager and producers. Additionally, there’s also an extended backstage behind-the-scenes clip that goes more in-depth regarding their breakneck schedule as well as an admission by Herron-Braggs that the only time she has to balance her checkbook (which she does pen, calculator, and book in hand) is while on the road. 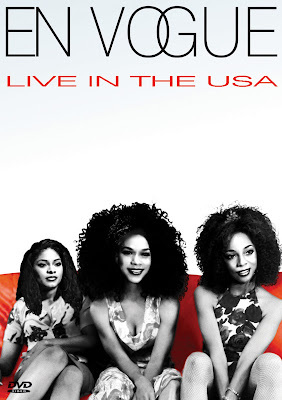 En Vogue Live in the USA offers a succinct history of the band as well as a bonus track that features Terry Ellis in duet with N-Jay-Brasco for “Never Stop.” And although the concert is fun and retro, it feels far too short, not to mention — considering it’s seven years old — that it seems a bit dated. I longed for more recent footage and insight, especially in light of a recent report that the original foursome may possibly be gearing up for a full blown reunion. And yet, you’ll find yourself forgiving the brevity as the women belt out such hits as “Free Your Mind,” “My Lovin’ (You’re Never Gonna Get It),” the crowd favorite “Givin’ Him Something He Can Feel,” along with Christmas tracks and the aforementioned medley, which includes “Respect” and the Emotions' “Best of My Love.” Overall, however, I still found myself missing the showmanship of a bigger performance and of those legendary music videos (which you can see here), such as their backing vocals on the Salt-n-Pepa hit, “Whatta Man." Therefore, in the words of one of their strongest tracks, when it comes to our affection for classic En Vogue, “Don’t Let Go,” as perhaps we’ll be treated with a return soon since we “Just Can’t Stay Away.” And in the meantime, we can always spin some classic favorites from these admirably genuine and affable divas who will remain funky forever in our hearts. This is especially apparent as the years go by as these ladies seem much more reflective about their careers and lives, remaining in control, and willing to discuss past mistakes candidly while articulating everything with the same ease with which they perform. In the end, the signifance and the very existence of En Vogue cannot be understated. They’ve not only become impressive role models to other female singers by illustrating the importance of working as a group and never letting one person be the sole leader (as in The Supremes and Destiny’s Child), but also to women everywhere. They remind us of just how crucial it is to free our minds from the limitations that society, others, and indeed ourselves label women as a gender.